A huge Super King Bed with a pocket sprung mattress, adorned with Egyptian cotton sheets and dominated by a spectacular headboard is the centrepiece of the main hut. Anne’s retreat is beautifully equipped for cooking and dining (in or out), the hut has all of the amenities and features you would expect of a top class luxury glamping destination with a fridge-freezer, gas oven and hob, and a beautiful belfast sink. Whether creating a culinary masterpiece, or relaxing in front of the wood burner with a glass of wine, your time really is your own in this rural idyll. Tucked away in its own meadow it offers total seclusion and unparalleled luxury. 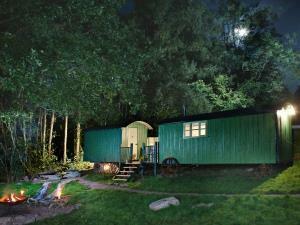 Linked by a decking enclosure, furnished for relaxing and al fresco dining, is the bathing and dressing hut. Enjoy the huge double ended bath with views of the wood or savour the separate full sized rain shower, both supplied with limitless hot water. Huge fluffy bath sheets and of course individual towelling dressing gowns and luxury toiletries are all provided. Outside you can enjoy the sheltered decking and dining area or take a few steps down to the fire pit to try your hand at cooking over an open fire. Lie swinging in the hammock, sit on the natural sheepskins covering solid ash chairs, or enjoy the natural oak seats (created from a fallen tree) and just enjoy doing absolutely nothing in this truly special place. With both huts centrally heated and fully equipped for all year use, on dark wet and cold nights night’s stay warm and cosy as you settle down in front of the woodburner and enjoy the fact that you are tucked up a world away from what’s going on outside. So much to see and do in Monmouthshire Penterry is steeped in history there has been a settlement here since the tenth century, abandoned after the Black Death in 1348 all that remains of the old village is the church, a short walk away from Anne’s Retreat and now isolated in the middle of a field. In the winter when the grass is short you can see the footings of where the houses and gardens were and even the burial pit where the victims of the Black Death were laid to rest. Gaer Hill, once the site of a hill fort created by Celtic Silurian Tribes, then occupied by the Romans (with earthworks still clearly visible) is a short stroll away and from there you can enjoy a wonderful 360 degree natural panorama encompassing 7 counties. There is masses to see and do nearby, with Castles and Museums to visit and wonderful pubs and restaurants just minutes away in Tintern and Chepstow. For those that want to escape the hussle and bussle of every day life, abandon the car, switch off the phone and just enjoy being in this truly special place. When you do want to get out, put on your walking boots and go exploring, wonderful local walks abound encompassing stunning views and of course some excellent pubs on route!